Randy Santel versus this massive tray of food. Who do you reckon came out on top? THE NAME RANDY Santel probably doesn’t mean much to most Irish people. The people of Cavan, however, know better. Yesterday Santel, a professional bodybuilder and eater, stopped by The Hardboiled Egg Cafe to take on their 8lb, 10 oz “World’s Largest Breakfast”. Santel, who is touring Europe’s food challenges, was called out by local man Taz Smith, who had finished the challenge before – but outside the hour allotted. Shockingly, both men not only finished within the hour, they absolutely destroyed it. Santel took just 27 minutes to put the tray of food away, while Taz was just eight minutes behind. Santel has previously beaten a 50-year-old 72-ounce steak challenge and taken on challenges seen on cult TV show Man V Food. Here he is eating a 6.5lb sandwich. Why? Because he can. 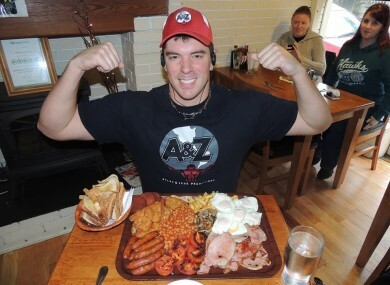 Email “A professional eater came to Ireland - and demolished a massive breakfast”. Feedback on “A professional eater came to Ireland - and demolished a massive breakfast”.